The Edmonton Oilers have fired head coach Todd McLellan and replaced him with Ken Hitchcock. SAN JOSE, Calif. — The Edmonton Oilers fired coach Todd McLellan on Tuesday and replaced him with Ken Hitchcock with hopes of reviving a team languishing in sixth place in the Pacific Division. McLellan was in his fourth season behind the Oilers' bench. The team missed the playoffs in two of his previous three seasons despite having superstar Connor McDavid on its roster, and the Oilers were just 9-10-1 entering their game Tuesday night at San Jose. "It's tough to pinpoint what we need, but we're all to blame here," McDavid said following the morning skate. "This obviously isn't on Todd at all. It's on us as players. That's just how the business works sometimes. We got to wake up here." McLellan is the fourth coach to be fired already this season, following John Stevens in Los Angeles, Joel Quenneville in Chicago and Mike Yeo in St. Louis. The Oilers have lost six of their last seven games and only the Blues and Kings are below them in the Western Conference standings. "I felt it was time to make a change," general manager Peter Chiarelli said. "Obviously we're in a rough patch here. We're leading into American Thanksgiving. It's a bit of a template for making the playoffs. I felt I was seeing some things that I had seen last year after not seeing them for quite a fair bit this year, and these recurring themes, I wanted to nip them in the bud." The 66-year-old Hitchcock announced his retirement in April after a 22-year coaching career, which included a Stanley Cup with the Dallas Stars in 1999. He had two stints in Dallas as well as head coaching stops in Philadelphia (2002-2006), Columbus (2006-2010) and St. Louis (2011-2017). The Edmonton native has the third-most wins in NHL history with an overall record of 823-506-88-119 (.603 winning percentage), behind only Scotty Bowman (1,244 wins) and Quenneville (890). He has guided teams to eight division titles and twice to the best record in the NHL. He captured the Jack Adams Award as the league's top coach in 2011-12 with St. Louis. "It's definitely going to be tough," said forward Kyle Brodziak, who played for Hitchcock in St. Louis. "It's always an adjustment. Guys will have to get used to different styles. Hitch is a hard coach, He's going to be tough on guys and demand a lot. We have to be ready to produce and face the music for sure." St. Louis made the playoffs in each of Hitchcock's five full seasons, reaching the Western Conference finals in 2016. The Blues abruptly fired Hitchcock in February last year, cutting short what was already going to be his last season in St. Louis. He returned to Dallas after 14 seasons elsewhere, with the hope of getting the Stars back to the playoffs but a late-season slump kept them out for the second straight year and the eighth time in 10 seasons. In April, Hitchcock sounded as if he was ready to retire for good. "I have contemplated this since our last game and I came to the conclusion that now is the right time to step away and let the younger generation of coaches take over," Hitchcock said then. Hitchcock's playoff record is 86-82, and he also has an extensive background with Team Canada, which he led to a silver medal at the 2008 IIHF World Hockey Championship. He was an assistant when Canada won Olympic gold in 2002, 2010 and 2014. 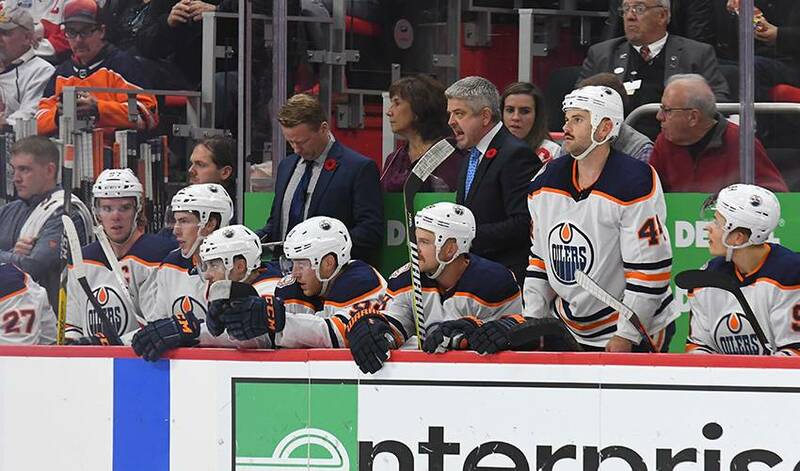 In Edmonton, there is plenty of blame to go around for the lacklustre start by a top-heavy roster led by McDavid and fellow centre Leon Draisaitl. Chiarelli traded winger Taylor Hall to New Jersey for defenceman Adam Larsson in June 2016, and then signed forward Milan Lucic to a seven-year, US$42 million contract a few days later. Hall won the Hart Trophy as league MVP last season, while Lucic has two goals in his last 66 games. "I'm certainly not absolving myself of any responsibility on the player personnel (side)," Chiarelli said. "This isn't just an indictment of Todd or the players. This is a collective thing and it's our job to get to the playoffs. "We owe it to our fans, and I felt this was the right move for it." Edmonton has also allowed 3.30 goals per game, second worst in the Western Conference. "He's always had very good defensive teams," Lucic said about Hitchcock. "We need to come together as a group no matter who the coach is. I don't know him very well, but you hear a lot of things about him and what his philosophy is. So, excited to see what he can bring to this group." Hitchcock becomes the seventh coach for the Oilers since the team fired Craig McTavish at the end of the 2008-09 season, following Pat Quinn, Tom Renney, Ralph Krueger, Dallas Eakins, Todd Nelson and McLellan. AP hockey writer Stephen Whyno and The Canadian Press hockey writer Joshua Clipperton contributed to this report.